Jungle Red Writers: At the Library? LUCY BURDETTE: When I was a kid, I went to the library in my little town every week and came out with a stack of books. Today, as I was putting the finishing touches on this month's Friends of the Key West Library newsletter (I'm the editor,) I got to wondering how the rest of you are using libraries these days. Last week I went to hear debut author Nathan Hill talk about his 10-year-in-the-making novel THE NIX--he was every bit as charming as I expected--and I scored a Christmas gift for a family member! Saturday, I helped set up for our monthly Friends' book sale in the library's palm garden. (Which is every bit as charming as it sounds.) Beginning in January, my intention is to start taking Spanish lessons at the library--I think it will be good for my brain and who knows when it might come in handy?And like most authors, I love talking to library book clubs about writing and my books. However, I've gotten into the habit of buying books, rather than taking them out of the library the way I did growing up. How are you using your local library these days? HALLIE EPHRON: I love my local library. We helped get the expansion funded, and our gorgeous mostly-new library is packed most of the time, really functioning like a community center. Right now because I'm under deadline so I'm not doing much, but I always support the Friends of the Library and have volunteered in their used book store. They have wonderful resources, like a scanner that I use all the time and access to any book you could ever want through their network of libraries. Did I say, I love my library? And look at this terrific night at the Concord LIbrary--I'm on a panel with Peter Swanson and another author--isn't this room right out of Hogwarts? Librarians and patrons are the most enthusiastic, and truly, where would be be without them? I love how libraries become a gathering place, for lectures or talks or panels or classes--and I've done many an event for my local Newton Library, whether speaking or emceeing or hosting. One more important thing: Sometimes readers say--as if apologizing--"I can;t buy your book tonight, but always take your books out of the library." My answer to that is --great! It's so critical to keep our books in circulation...if no one checks them out, they go off the shelves. Nothing better than having a long waitlist! RHYS BOWEN: I grew up in the country, outside a small village where the only library was a small paid lending library in the yarn shop. We moved into town when I was 14 and I spent so much time at the big library down the hill that my father was sure I was meeting a boy. And I was allowed into the adult section. I found Georgette Heyer and Jean Plaidy and lots of good stuff. We had Agatha Christie and Dorothy Sayers at home so I knew them. I used to use the local library here in Marin for reference. The reference librarians were brilliant when I asked questions like "In what year was elastic first used in underwear?" Now most stuff can be found online. I don't often check out books, as most things can be read on a Kindle. I do attend programs from time to time, but our local libraries are not brilliant as they are in other parts of the country. I'm spoken at libraries all over Illinois and they are fabulous. Also Santa Monica was gorgeous and vibrant. When I am in Arizona I usually drive to Scottsdale main library where they do have diverse programs from book groups to classes. And the best library is out in a small town called Cave Creek where there is always something fascinating going on. Half an hour's drive but worth it.! (I've spoken at an English tea party there). DEBORAH CROMBIE: Oh, yikes, I am embarrassed to say how little I use my library. I loved my local library when I was growing up--checked out the full allowed number of books, every week--and then when my daughter was growing up we used the library in our old Dallas neighborhood (even after we moved fifty miles away) all the time. We did weekly story times, and then summer reading club, all the great activities. And I volunteered. In fact, I was working as a volunteer at the library when I wrote my first novel. But now, it's the "busy-ness" syndrome again. I have more books in paper and on Kindle than I'll ever manage to read and there's always something new I need to keep up with. When I do check out books, I forget to return them. I'm afraid the most I see of libraries these days is when I get to do speaking engagements in them. The next generation is starting out right, however. Granddaughter Wren is going to story-time twice a week at our local library! How about you Red Readers, do you use your library? Libraries? I love libraries! When I was in school, I always had an armful of books checked out . . . . When our children were little, we went to the library for summer reading programs, for special activities, for lots and lots of books . . . .. I was a regular at my hometown library growing up, too. I still remember the thrill of crossing the lobby from the children's department to the grown-up books when I got old enough. And, my school libraries were important to me, too. I took my children to the library programs at our library here, and my daughter has and is taking her daughters to their library for checking out books and programs. I buy a ton of books. I like owning them and having them on my shelves. However, I still go to the library at least once a month to check out what they have in and to occasionally check out a book. What I mostly use the library for these days is to check out books on CD. I drive at least once a week to my daughter's, an hour each way, so I like to listen to books often. What ends up happening so many times is that I will start the book on CD and finish it in print. In fact, sometimes I will check out an audio book for which I have the print copy just to get me started on the book. I haven't been too happy with my library of late concerning book suggestions. First, the people working there don't seem much interested in mystery and crime, and they are not open to suggestions of new authors or books. They used to be much more open. A friend of mine who frequents the library at least a couple of times a week has expressed displeasure over the lack of openness to suggestions, and she says that the people working there never seem to have read anything she asks about. I'm not trying to dis young people, but there are mostly young people working at our library now, and they would do well to listen to people who've been around a while and read a lot. Growing up, our family could not afford to buy many books, so I was taken to the local library all the time, and I always came out with an armful of books to devour. And now I do like owning my own books (getting close to 10,000 mysteries in my collection!). But as a retiree, I do have to be more choosy about which titles I buy. So I also go my excellent local library branch several times a week to check out (mostly hardcover) books. They have a very good selection of mystery books, even better than the Toronto library system which apparently is the largest in North America! About the time I was 8 (1954ish), I discovered the library. I could walk there all by myself after school to wander the children's section in the basement. As I remember, this was a solitary pleasure -- all those books to read and the quiet. Loved it. And have had brief affairs with libraries as an adult. Broke off my most recent affair by just drifting away...the parking situation is impossible because the city opened a school that abuts the library parking lot...and, she says with snark, just everybody obeys those "library parking only" "two hour limit signs"! It is great for the preK kids who get to walk to the library every day. Most of my library trips are to the Friends bookshop in the next town over (open more convient hours and better parking) to donate books as I try to simplify ;-). I started taking home books from my then small town library when I was four and haven't stopped. I am in a new small town and the library is the center of many, many town activities. They have activities for all ages including bedtime stories for little ones to come in p.j's. to lecture series for adults and everything in between! Yes and interlibrary loans as well. I love libraries!!! Like many of you I don't check out books as often as I used to - but if there's a new author I want to check out, or someone famous I think I might or might not like, that's a perfect fit for a library request. I don't even want to pay for kindle version if I think I might not want to keep the book. We use the Friends' passes to local museums - a great way to save a few bucks on admission. We also stop by and pick up the Sunday NYT puzzle, which they make copies of every week (since we don't subscribe, which might horrify some, but hey...). And I've spoken on panels there quite a few times. The reference librarian is also a great resource for local history, and I've spent quite a bit of time in the "Amesbury Room" poring over old documents and newspapers both on paper and microfilm. Couldn't live without the library, and it's only a five-minute walk from my house! Yay, lots of library lovers here, as we suspected! Kathy, that's disappointing that your librarians don't take suggestions well! Edith, so smart for the library to make copies of the crossword, I've never heard of that. and aren't you lucky to live a 5 minute walk away? I use my library all the time. I'm fortunate to live 3 blocks away from what must be the smallest of Toronto Public Library's 100 branches. Though tiny, it's my pick-up point for all the books I order from the system, and I rarely have fewer than 50 books lined up in my holds. I love libraries so much that my first published crime story involved a battle between an evil library-hating mayor (inspired by a real person) and a crusading library champion/bestselling writer (also insired by a real person). Of course I gave it a happy ending. Sorry, Lucy, no more than polite libraian and patron conversations in my past or present. Thank you for making me lol too this morning. First plowablw snow in my part of Connecticut today --feeling that my departure for FL at end of month is tooo far in the future. Kathy: Yes, it is unfortunate that your library's staff do not take suggestions well. Ottawa's library system is great and allows us to request new book purchases all the time. And I usually have over 100 hold requests in my account. Susan: I agree the Toronto library system is great since you can request your holds to be delivered to your local branch. When I lived there, my TPL branch (Locke) was a 2 block walk from home...it was in a lovely stone building and a great place to visit. Enjoy! Kathy, that's discouraging about your narrowly focused librarians. This is making me remember my first library card. It was pink with an embossed metal trip inserted into it with raised numbers that they inked and printed when you took out a book. And remember when you could look in the pocket and see who'd taken the book out since the library acquired it? Yes I loved seeing who else had read the book! The local Cincinnati-Hamilton County library branch is swarming all the time. It offers a free hold service and Ohio Link, from which I can order books from Ohio colleges and universities. I've been as high as 1000 on the hold list, but in time, the books always appear. The downtown library has reference librarians who take phone calls and emails. I loved seeing how many people had taken out the book! And as a reporter ,I learned to use libraries by phone--and would call the research librarians. (JUst like Desk Set! EXcept I knew the reindeer.) . AND if I was working late and the Boston libraries were closed, I realized I could call California and get info for three more hours.! What a great topic! Like Deb, I've grown away from using the library as I used to. Since I'm still working a day job, days are taken up with office work and nights with writing. Weekends are crammed with everything else. As a child, we lived at the library. It was a wonderful, mysterical, place that fired everyone's imagination We were luck with our librarian too. She encouraged us to act out what we were reading and taught us to sight read with feeling. Our library in my small town is in a gorgeous building right on the river. I have to figure out a way to get there more often! 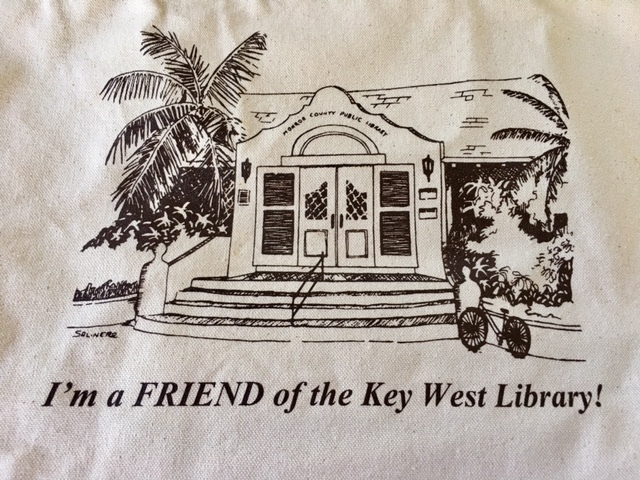 My daughter practically LIVED at the Key West library, we had an apartment right across the street from it. She loved that big tree in the back. After moving up the Keys, I got books mostly from the Bookmobile. When we moved to Bradenton, my nephew and I went to the library every Saturday, got books and videos, then went to McDonald's, then to the park, Now, I use the Brandon Public Library. I have about 1500 books on my Kindle, but there are many authors I love whose books don't often come up as "bargains" so I get their books at the Library. I went the library all the time when I was kid (the school library and the local library) but now I'm all about checking out books on my Kindle. I was thrilled when our library added this option because it works so well with my busy schedule. How does that work, Cathy? Deborah, don't feel bad. I haven't been inside my local library (which is a lovely Carnegie library and the staff is truly charming) for anything except a couple of events in years. But as a girl I peddled my bike to our library every week to check out the max allotment of books. My kids walked to the aforementioned library after school for a couple years and I'd pick them up. But The Girl complained that the boys would come in to use the computers for video games and be loud, so it wasn't an enjoyable experience for them. And I was stunned when she had a research project, I went to the library and...nothing. Not a single good reference book. What? The Girl is now in high school within walking distance of the main Carnegie library for Allegheny County. She sometimes goes there. And when she had her Nook, she'd check ebooks out of the library. But she prefers paper books and we've lapsed in the "book buying" habit these days. I couldn't get The Boy to visit a library if I paid him. Total non-reader and I haven't been able to do anything about it. I admit I rarely use the library these days. Ours isn't very satisfactory for checking out e books, long waits for a digital file? Come on now. So many of these shared stories hold for me, too--loved the library as a child and as an adult--my favorites? Two--the main library at Ohio State--stacks and stacks and stacks 12 floors of them--with great special collection rooms tucked away unexpectedly. And the old art library--just such a great room in which to study--the stacks went down into the basement--narrow, dark little corridors of books--very creepy and cool. Love my local libraries--there are 5 within easy driving distance--all are linked to the greater CLEVnet--so can request books from any of the 40-50 libraries within the system. I've utilized most of the services--I can even download checked out ebooks from home using my library card. But, Kathy, I hear you about the service--much of the current staff consists of young women who are more interested in watching the clock and gossiping rather than providing help. I've actually had books shoved across the counter at me lately. As a former librarian, I have literally spent years in libraries of all types - public, school, private sector, non-profit - and I loved them all. I even met my husband in a library - true story! I still use my library once or twice per week, but it's mostly a sanctuary for me to escape the frat house I live in and get some writing done. I have a particular study carroll where I can look up at a stained glass window and out at a view of the park. It's my favorite place to work. One day we're going to need to hear that story about your hub! Gram, I love the idea of bedtime stories! It must be adorable seeing all those PJ-clad kids! Susan D., fifty books in your holds list? Impressive! I love the Seattle Public Library. I've had the privilege of teaching writing workshops there, but I also use it as a patron. The library has 26 branches and a mobile library, but I use the central branch, a gorgeous building designed by Rem Koolhaass and Joshua Prince-Ramus. If you ever visit the city, the library is a must-see. I've also had the opportunity to become friends with a few of the librarians, and they are a wonderful bunch. Ideally, urban libraries are more than just places to take out books, and that's true in Seattle. The SPL is a community gathering place where people learn all kinds of skills and are enriched in a variety of ways. They offer language classes, story times for all ages, citizenship classes, homework help, and adult tutoring to name just a handful of their programs. Fun fact: the "Story time with a Firefighter" is extremely popular, according to an inside source. With the parents. I still use my local public libraries quite a lot. I go to two book clubs that meet there; I volunteer at bi-annual sales; I try lots of new musical artists from their CD collection; I borrow DVDs that we want to watch but don't want to own; I look at their copies of magazines that aren't available for free on line; and I borrow a steady stream of books that I want to read but can't afford. When I did NaNoWriMo we met almost exclusively in libraries. I have several friends who are librarians or retired librarians, and I really appreciate all that they do to make things run smoothly. I love the easy access that we have to the collection online so that I can see that I'm down to #96 in the queue for The Underground Railroad. Fortunately our librarians are eager to hear recommendations and have bought some books that I suggested. Just went to our local library to print and scan a document for Youngest (my printer's on the fritz) and I took out a great novel: THE WANGS VERSUS THE WORLD. I'm also a volunteer at The Very Small Library, so I'm there several times a month. To me, libraries and churches have the same feel to them. A calm patch of civility in a troubled world. Jim, that sounds like a great library you have! Our wonderful Public Library of Cincinnati and Hamilton County has played many roles in my life. As a young mother I found lots of books to read to my oldest daughter. We could walk to the library from our apartment. When I worked as an assistant to five stockbrokers at Merrill Lynch I called the answer desk nearly daily, getting historic stock information. Later, that resource became valuable for other information, as well, including research for my kids. We went to story hours, my kids participated in summer reading programs, and one of my bookclubs consists mainly of retired librarians, including our neighbor, who ran a branch for many years. The other bookclub I'm in includes two blind members; every book we choose has to be available in audio format, and so we always check the library's website first for both audio and print versions. Most recently, one of our members chose a book while at the library and the librarian signed her up for a "bookclub library card". It includes the ability to pick up several copies of one title at a time, and there is no return deadline. The books came tied in a bow, too. Our library has collected donated books and other media for three decades. The program is so successful they've expanded the single annual sale to several per year, all over town, of used books. I usually pick up a supply of deeply discounted audiobooks for long car trips at this sale, as well as fill-ins for my favorite series. The sales also include rare books, and art, and lots of other cool stuff. The books and media are separated by genre, so the children's area is off by itself. And huge. It's always gratifying to see how packed these sales are, too. Oh, the Bookmobile! When I was a kid growing up in Hamilton, Ohio, the Lane Public Library sent the Bookmobile to our street once a week in the summertime. (It might have also happened the rest of the year, but I never knew anything about it, if it did.) The highlight of my week was to step onto that amazing mobile library. We lived there for five of the most important reading years of my life, too, fortunately. I have a British Library card, and that I'm very proud of. I did get to the library on my recent visit to London. It is a fabulous facility and I would practically live in it. Unfortunately, all the tables in the cafe are always taken with people working on their laptops--which is exactly what I'd be doing. Lucy, yes, the parents are drooling over the firefighters. Whatever gets them in the door! My love affair with libraries started very early in life and I began working after school in my hometown library as soon as I was old enough. Although I spent my professional career in non-profit and corporate libraries, I now get to give back as a trustee to the place that got me started. Like many others, I don't borrow as many books as I used to -- I'm fortunate to be able to buy many of the books I want. But I do still borrow some books and DVDs. I love how libraries change with the needs of their communities and how each one has its own personality. I think it's hard to overstate the role the library played in making me who I am today. I grew up in a small Ohio town and my mother was a high school graduate homemaker (and my dad a dropout construction worker), but she took me to the library twice a week and we each checked out the maximum allowed books. Those library visits opened the world to me. I got to move to the adult section before I reached the magic age because I had read pretty much all the books in the children's section! I am still a big library user. Yes, I buy my favorite authors' books on Kindle as soon as they come out because I'm not patient enough to wait my turn. But I have books on CD out at almost all times, and if I know I'm going to have extended reading time, like over a holiday, I sometimes check out physical books, too. I also use the library for online access to lots of research databases, and attend programs there. And of course, took my son there regularly through his childhood, creating another library lover in the process. I'm very fortunate that our local library is excellent, often winning awards and recognition. I couldn't live without the library! My elementary school library was open twice a week in the summer and we could borrow two books at a time. Torture! I tried to read as slowly as possible, but I've always been a fast reader. The librarian was terrific, though, and I credit her and my parents (who taught me to read before kindergarten) for my enduring love of books and reading. Later on, I used the library for reference purposes, but I haven't found the need for that since the Information Age began. Although I do buy books, I borrow most of what I read from two libraries--the city and county branches closest to home. The county branch is far superior, and when they started charging me $80 per year to use their services because I lived a couple of miles away, I paid up. Then, suddenly, the charge was lifted, and I was in heaven. One library allows 12 holds and one 5, and I try my hardest not to be at the max so I don't put pressure on myself to read multiple books in a short window, but it's difficult. I don't really need suggestions from librarians, so I don't know how our library staff would measure up in that area. I'm a member of Sisters in Crime (not a writer), and I also faithfully read Library Journal Prepub Alerts, Shelf Awareness, and other sites for books coming out months from now, put them on my TBR list, and place holds when they hit one of the library catalogues. But I'm happy to say the county library actually bought a book that I suggested. That library is also open 7 days a week and is actually extending its daily hours starting in January! Oh, Hallie, I remember those cards well, where you could see who had checked out the book before you. And, in elementary school, we had those same cards where we kept track of the books we were checking out. I still have a couple of mine, a sentimental prized possession. One of my all-time highs as a book lover was when I obtained my Library of Congress reader's card in D.C. To do this, you have to go to the James Madison Building, across the side street from the Thomas Jefferson Building, the library building, and apply for a reader's card. It was a simple process, and I promptly received my laminated card with my picture on it. I was then able to go back to the Jefferson Library of Congress building and have access to the reading rooms and main room and request materials to look at. I requested some materials on my ancestor Daniel Boone and waited at one of the long tables in the main room while the material was gathered and sent up to the main desk. I will never forget that amazing feeling while sitting in that main room, looking at materials from the Library of Congress, and looking up at all the beauty of that room and building. On tours, either self or group, you are able to look down at this main room, but you can only enter it if you have a reader's card. I was in library heaven as I sat there in that room looking up at where I had only before been able to peer in. Of course, there is an abundance of beauty and awe to be had touring the Library of Congress building without going into the main reading room. The murals and paintings on walls and ceilings are breathtaking. And, I've long been fascinated with the bookmobile, especially those of the past and the innovative ones. A book I read entitled The Camel Bookmobile by Masha Hamilton was one of the innovative ones. A Pinterest link to pictures of bookmobiles past and present can be found at https://www.pinterest.com/amlibraries/bookmobiles/ And, the American Library Association celebrates National Bookmobile Day during the middle of April. A friend worked for a couple of years as a housemother on an Indian reservation in North Dakota. During the school year she cooked for and watched over a houseful of native children boarding students. In the summer, though, she and another employee drove a mobile library around to small towns and native outposts, delivering books. There is a program for this; the books are donated, and individuals may take as many books as they want, to keep, not just to borrow. She said it's a popular program, and she loved seeing everyone in town come out to greet them. I've been a library lover and patron since I was old enough to read. Truly. Every town we've lived in, I have visited the library. My most recent checkout was Hank's Say No More. As has been noted, I can't buy everyone's books but I can request them from the library. I go online to see the new books and put anything that looks interesting on request. Our branch library is walking distance if I'm ambitious that day and the weather is good. The original building is a lovely Spanish colonial style that is around 100 years old. When I was a kid we went to the library all the time but when I started working, I bought books and donated most to the library after we read them. Things got more expensive so I buy some books and e-books and get the rest from the library. Now I'm retired, I'll need to make copies there, too. This topic is close to my heart right now as I inherited my love of reading from my mother who died last month. She would take my siblings and me to the library every week or so. I loved the library! As an adult I frequented bookstores more often than the library until I retired from a career as a medical writer. Now I volunteer at my local library once a week sorting new donations. I also will check out books that are newly published to save money or are books that I know I will only read once. We have an active Friends of the Library organization and hold monthly book sales. Before my parents health became frail I volunteered twice a week or more, but now once a week will have to do for a while. I started reading when I was 3 and became a library user about the same time. I began my library career in 6th grade and left when my hearing gave out. I visit my local branch weekly -- Hello fellow Hillsborough County Library user!. Hank asked about e-books. A lot of public libraries subscribe to a service called Overdrive. It has thousands of titles ready to be checked out. I got my e reader in April and have already read almost 90 ebooks. When the borrowing period is up the book is deleted from your reader. A few years ago, I went to the archive section at the University of Florida's Library in Gainesville. I was able to touch, and read, the typed manuscripts of John D. MacDonald. such a treasure. Reds what libraries will get your manuscripts? As a librarian, I just couldn't get through all the comments. I'll have to come back. Too many tears in my eyes. I love that you all support, remember or use your public library. When I interview authors on my blog, it's always my final question, Tell me a story about a library. Thank you. There are wonderful stories here. I'll come back and read them all. Lesa! LOVE you so much! And you have changed so many lives! The library and bookmobile were vital to me when growing up, small house, one paycheck, five children. Dad encouraged library visits. Even my brothers, though not scholars, joined me on summer mornings' walks to the library. Bill said it was partly because big chunks of the day had little to offer on television. During my years of teaching, I didn't use the library as much, though often enough that when one of the librarians found a student's lost class ring, she called me to come get it. Now, retired with lots of reading time, I am at my closest branch at least once a week to pick up and drop off materials. I still prefer "real" books. My librarians take note of my eclectic tastes, order books I request, and have designated me their "favorite customer." I also attend a book club, craft group, and story swap once each month (I started that one), as well as tempting special events. I was a regular library user from age 5 on. I visit my local library at least twice a month. Often I get hard-copy of a book I've read about in a blog or from an email subscription list. If my library doesn't have it then I request it via an Interlibrary loan which works about 99% of the time. I do read on my Kindle particularly when traveling since it's much easier than packing "real" books. Great post! Love the library. My family volunteers at the annual book sale. I borrow many books from the library since I have no room for more books. Once in a while, they purchase a book that I suggest. I recently read the first in a series by a new author and loved it! I asked my library to buy more. We offer storytime for babies and toddlers. They also have art and crafts. Tutoring for kids in local schools. Very grateful to have a library.